Daniel has an ongoing thing with ear tubes. Mostly the problem is everything looks fine when they first come out but then a couple months later he fails a hearing screen and turns out his ears are full of fluid. He hasn’t had trouble with ear infections particularly. No more than our other kids, but he does have regular issues with fluid in his ears. Anyway, the result has been that he’s had 3 sets of tubes, with several months between one set falling out and getting another. And I really wish we didn’t have to wait until his hearing is in trouble again before they put new tubes in. His ear canals are tiny. He KEEPS having problems with fluid in his ears. Can we not just go ahead and put tubes in? So, one of my very good friends is a para in Daniel’s classroom and y’all. It’s the best. Not only does she take adorable pictures of him working at school and text them to me, I get to hear all the GOOD stories. Anyway. It’s fantastic. And look how cute he is! Daniel self-identified for the first time tonight. We were asking him everyone’s name at dinner (a normal family activity around here) and he was naming everyone as usual. But TODAY, when we got around to him and asked “who is this?” he said Daniel! He’s 5, so this probably doesn’t seem like a big deal, but for us it is. He’s been able to identify teachers and peers by name for over a year, but he had no name for himself. Self-identification is a goal on his IEP. We have *actively* worked for this moment. So. Big day around here. Obviously I also made him do it again (a whole bunch of times) so I could get it on video and OF COURSE that video is going on Instagram and Facebook so you can all see it. Next we went over the plan for kindergarten. The recommendation the team gave was to have Daniel placed in a traditional kindergarten classroom and also spend time in the Intensive Resource Room. The IRR is (you may have guessed) more intensive than the regular resource room. 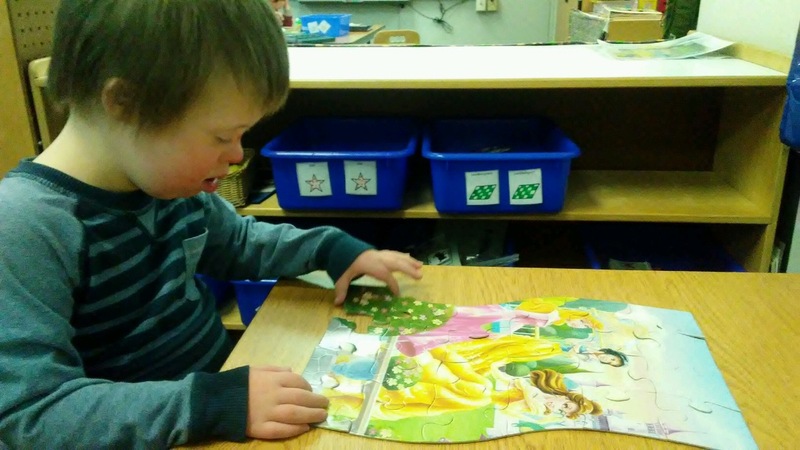 The benefits for Daniel are that the IRR provides daily therapy practice, in addition to being pulled out of class for speech/OT/PT, and provides him his own workspace for subjects where he is far enough behind his peers that it doesn’t make sense for him to be in the traditional classroom for those subjects. The IRR has its own teacher and is tiny, in terms of student numbers. (Currently only 2 kids are assigned to it, they are also both boys with Down syndrome, which made me smile.) They also provide music therapy, which I’m sure Daniel will LOVE. Daniel will also have a para (a helper) assigned to him who will be with him all day. (The IRR will also help train the para in how to incorporate Daniel’s therapy practice into his regular classroom stuff.) Kindergarten in our district is 1/2 day, unless you want to pay for full day. However, because Daniel needs so many therapies and extra help AND we want him to spend time with his typical peers, the team recommended on his IEP that he be placed in a full day class (with fees waived, since this is considered part of his services.) They gave a sample schedule to show how his day would go, and reassured me that he’d be spending more than half his day in the traditional classroom. It all sounds pretty great, and I feel sure Daniel will thrive. Kindergarten! 3 kids in school ALL DAY LONG! Pretty crazy. Daniel. Our sweet baby Daniel is FOUR! Not sure how this happened since he’s supposed to stay my baby FOREVER. Anyway, he had HIS well visit today. (And Will has one on Wednesday. Apparently I enjoy the pediatrician SO MUCH that I scheduled 3 visits in 2 weeks.) He is healthy and although he’s on the small side for typical kids (he only weighs 1 pound more than Lydia!) on the Down syndrome charts he’s at the 90th percent for height and about 40th for weight. He’s followed by so many specialists that well visits are mostly for vaccinations (none today though!) but it’s still good to check in and hear that all looks good! I’m sure I’ve mentioned here before (and if I know you in person, likely complained about it to you extensively) but we’ve had a long-running issue with Daniel throwing food. Not just, dump-his-plate-at-the-end-of-a-meal throwing, but can’t-put-more-than-one-bite-on-his-tray throwing. He would also throw his plate, cup, or silverware, if HEAVEN FORBID you try to set that on his tray. It’s been A THING. I can’t remember if it started when we moved out here, or if it started before that, but it’s been going on for a long time. I talked to his PT and his speech therapist when he was in early intervention. They made some suggestions, but nothing helped. I’ve talked to his speech therapist and his preschool teacher now that he’s in preschool. Again, nothing helped. But then! 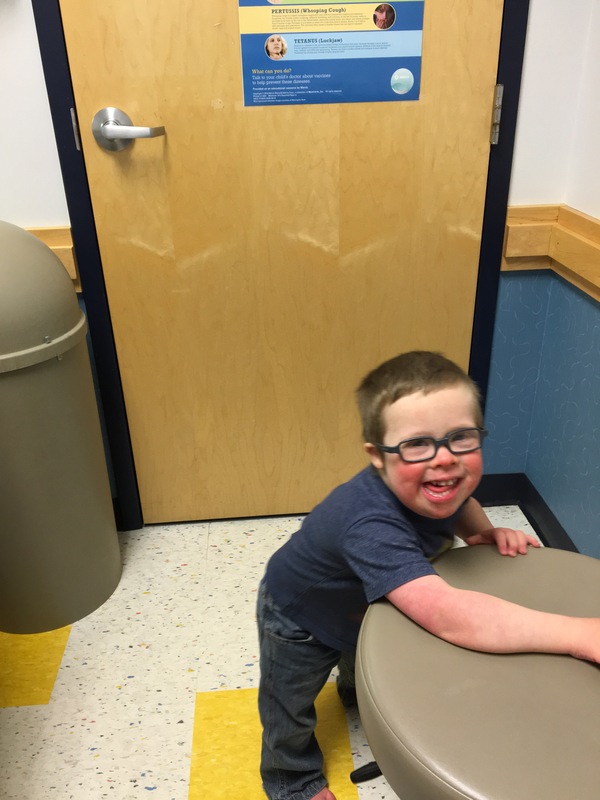 Last month he had an appointment at the Down syndrome clinic here at Children’s (because they like to see kids once a year to check in) and you know what? They have a behavioral psychologist! Who specializes in kids with Down syndrome! First of all, do you know how hard it is to not react AT ALL when your kid throws food on the floor? Harder than I thought. Also, 30 seconds is kind of a long time. But, IT WORKED. He’s certainly not perfect but it is SO MUCH BETTER than it used to be! We’ve graduated to being able to set his plate on his tray, at which point he’ll feed himself 2 or 3 bites and then either point at the table or pick up his plate to hand it to you. (I don’t know why he dislikes having it there, but WHATEVER I DON’T EVEN CARE.) He’ll feed himself an entire meal! This is huge for us. So. It’s been awesome. So! A follow up on Daniel’s surgery. I mentioned a while back that Daniel was going to have surgery to have his tonsils and adenoids removed and tubes put in his ears again. Well, that happened! His surgery was on the 15th of December, in the morning, followed by an overnight stay for monitoring. Normally their cut-off is age 3, kids 3 and older don’t generally stay overnight following this particular procedure, but because Daniel has Down syndrome they wanted to keep an eye on him for the night. Anyway, the surgery went well. Tonsils were very large, adenoids were blocking 60% of the space back there, which is obviously less than ideal. But now they’re gone! Only one ear had fluid, but tubes should help keep them dry which is important for hearing. And, of course, hearing is especially important as he’s learning to talk. Post surgery he seemed okay. Obviously he was in pain, and he hated having to take his meds, but he ate and drank just fine. No hospital night is particularly restful, but nothing out of the ordinary went on, and when the ENT team came by in the morning they said they were fine with discharging him. We were home by 9:30 that morning. Barely 24 hours in the hospital all told. I had my tonsils out at 22. Brian had his out at 29. We are both well aware of how rough the recovery can be. And even though kids are supposed to bounce back much quicker, we were expecting it to be rough! But it did not go like I expected. Anyway, post surgery I was expecting Sick Daniel. I expected that he wouldn’t want to eat (I know I didn’t), that he would want to be held a lot, that he would sleep a lot, and that we would have to be very careful to stay on top of his pain meds. (They don’t do narcotics for kids under 5, by the way. Just over the counter stuff.) What I got? Was Mad Daniel. Oh my gosh you guys. SO MUCH YELLING. Every medicine dose (so, every 3 hours alternating acetaminophen and ibuprofen) was a fight and there was much screaming afterward. But a late med does? Extra screaming. Whenever Brian left he screamed. He screamed when I tried to feed him, but he also screamed because he was hungry. My nerves were shot. Days 3 and 7 were the worst (as we were told they would be.) And then, right at 2 weeks, he turned a corner! Suddenly he was fine even if meds were late. He didn’t scream at me during meals because swallowing hurt. WOOHOO! Of course, now we have to undo all the bad habits- all day TV, giving him whatever he wants to eat (pudding/ice cream/noodles (mac & cheese was about the only real food he wanted)) and just generally letting him get away with everything because he was recovering. Oh, like the fact that suddenly he doesn’t want to wear his glasses? I don’t even know what that’s about, but I blame recovery. I’m hoping getting back to school will help with all this. Anyway, I’m glad we did it. Even in the first days home I noticed a difference in how loud he is when he sleeps (much quieter.) And although we all caught colds right around Christmas, this one has not developed into the nasty cough he usually gets. So, yay for successful surgery! ANYWAY. Daniel is now scheduled to have his tonsils & adenoids removed and tubes put in. They said the surgery is about an hour long, but they’ll keep him at least overnight to monitor everything and he’ll have to meet the “intake by mouth” requirements before they’ll discharge him. SO. This should be…interesting. Oh, we’re fortunate that Daniel doesn’t have any heart issues, otherwise they require a pre-surgery consult with a cardiologist. We may have to do a consult with anesthesia, but they weren’t sure today. We’ve known for a while now that Daniel is far-sighted. 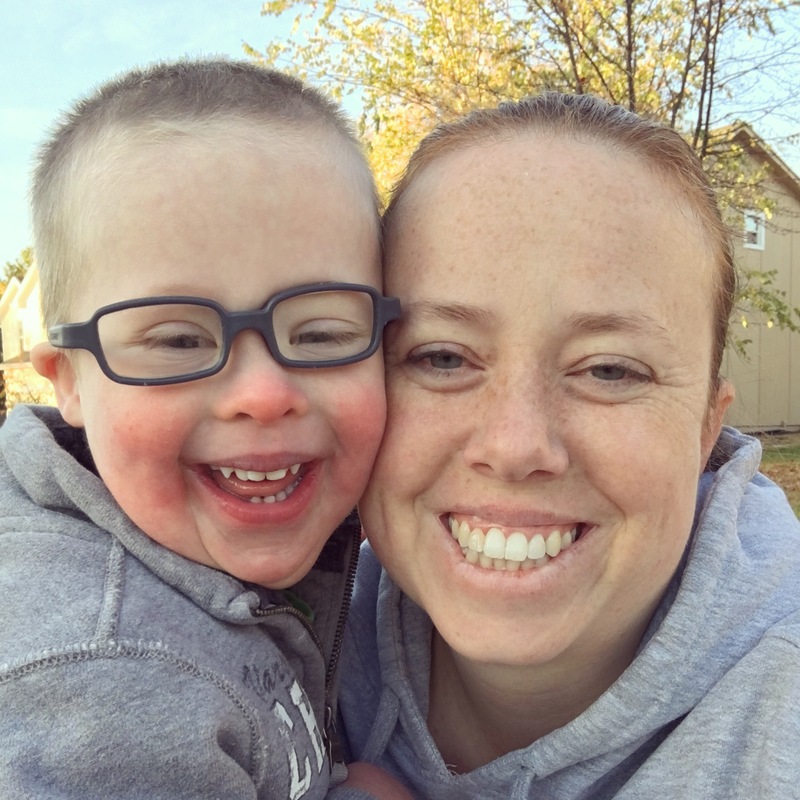 It’s recommended that kids with Down syndrome get their eyes checked out by a pediatric ophthalmologist at least once a year because eye problems are common. The first time Daniel had his eyes checked was 6 months. At that point they were just checking out his blocked tear ducts, and after checking back at 1 year they had cleared enough to leave alone. (His eyes are still prone to goopiness though, any time he has a cold or congestion.) At his 18 month appointment the doctor told us he was slightly far-sighted, but that she didn’t think glasses would be worth the fight at that point. His vision wasn’t bad enough that glasses would make a huge difference, and it wasn’t interfering with his development at all. (Really bad vision at that age could have interfered with depth perception, making learning to walk extra hard.) Then we moved and…I don’t think we got his eyes checked when he turned 2. Anyway, when he turned 3 I DID get his eyes checked and at that appointment the doctor said she would either write a prescription then, or we could come back and check in 6 months. I opted for the “check back in 6 months.” We had noticed some eye crossing and squinting, and she told us definitely call if those got worse. Well, those did get worse over the next couple months, and I called, but the next available appointment ended up being around the 6 month check in point anyway. There was no question we’d be leaving that appointment with a prescription. Nurse: So, we did vision screenings today…Daniel’s teacher said he recently had an appointment at the eye doctor? Me: Yep, on Wednesday. His glasses are in the mail! and then she went on to describe stuff we’d seen too. And she told me she’d send home the results, be that we could obviously ignore the recommendation for a full eye exam. His glasses have not been NEARLY as much of a fight as I expected. I figured he’d be taking them off every 2 seconds and refusing to wear them, but it hasn’t been like that! He can CLEARLY see better with them on, and he recognizes that too. He’s happy for us to put them on in the morning, and although he does get tired of wearing them sometimes and takes them off, that is happening less and less often. Plus, look how cute he looks in them! Now on to ears. 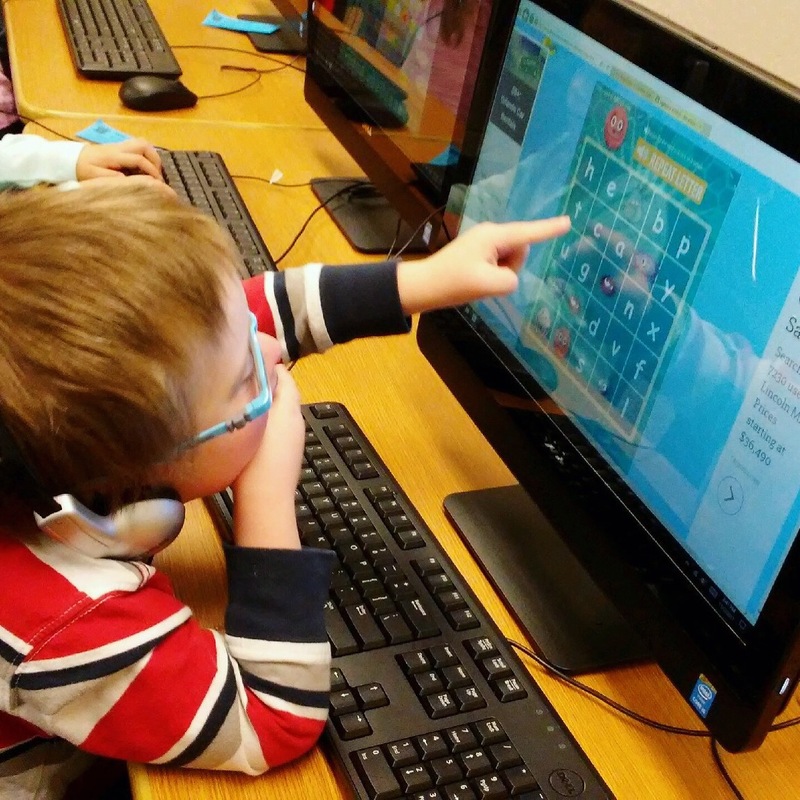 Hearing screenings happened at school a couple weeks ago and Daniel’s results were not good. If you’ve been reading here long you know that this isn’t the first time we’ve had trouble with his ears. (Which, again, unsurprising for a kid with Down syndrome.) He failed all his newborn hearing screens, and then failed a couple hearing tests at the audiologist once he was out of the NICU, had an ABR, blah blah blah, finally had a set of tubes placed at 5 months and passed a hearing test. He had his second set of tubes done at 18 months. At his 2 year appointment Daniel’s pediatrician referred us to an ENT at Children’s because he couldn’t tell whether the tubes were still in place or not. Turns out not, but the ENT couldn’t see any fluid, so he didn’t think Daniel needed another set of tubes right away. But, that’s been more than a year ago and it looks like he probably needs tubes again. So! ENT appointment later this month. I will let you know how that all goes.